Technology is seeping through into the Govt departments as more and more technical gadgets seen put to use in day to day administration work. 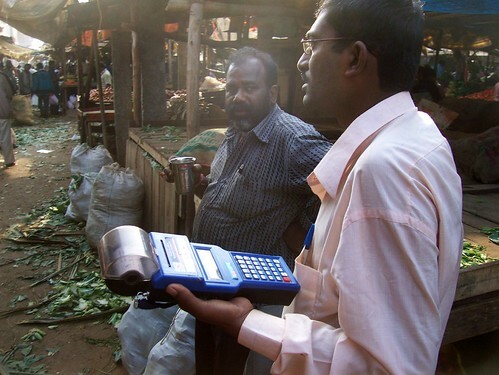 A tax collector moves around HAL market to collect taxes from vendors selling vegetables in the market the device used helps retrieve tax dues and prints instant receipts storing the data that can then be uploaded onto the central databases once back in office…. Buses, trains, and now at the vendors! It is wonderful to see that India’s silicon valley is taking to the technology that it so merrily sells to the rest of the world. Now, am waiting for a time when all the government offices will be computerized with no paperwork. That should cut down red tapism to quite some extent. Lovely post..thanks for sharing. I have a similar one…hope to post soon! Technology usage in Bengalooru by Government organisations has been quite impressive and it’s all done very quietly without much fanfare. I wonder about the scenario in the districts. This is quite impressive and very effective at ground level. I hope the tax officers also visit the myriad of business shops in MGs, Brigades and Commercial Street who I know escape from paying their real tax dues.